Home of the croft family for nearly 1000 years, Croft Castle is a place of power, politics and pleasure at the heart of a 1500 acre estate of woodland, farm and parkland. Explore miles of way-marked paths, learn about the family who have made croft so special, see fine Georgian interiors and family portraits. Relax in the walled garden and stroll through the woods to the iron age hill fort at croft Ambrey or discover crofts stunning collection of over 300 veteran trees. Enjoy the atmosphere rooms including the 1920s saloon. A stunning riverside garden with sweeping views along the River Wye and Herefordshire countryside. The garden is spectacular all year round drifts of spring bulbs give way to summer wild flowers and autumn colour on the mature trees. The walled garden, full of fruit and vegetables is worth a visit any time of the year. This 1,700-acre estate was bequeathed to the National Trust in 1946 and still maintains traditional farms, ancient woodland and Herefordshire orchards. Enjoy a variety of walks through the parkland, a rich habitat for wildlife and with stunning views of the surrounding countryside. At the heart of the estate lies lower Brockhampton, a 14th century moated manor house with a unique timber framed gatehouse and ruined Norman chapel. Explore the grounds and surrounding paradise valley on the nature trail, visit the bird hide and natural play area or relax peacefully with a picnic by the moat. Have you visited Berrington Hall National Trust property . 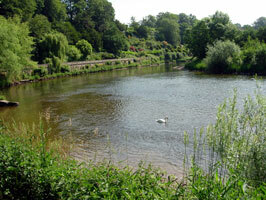 If you are visiting Herefordshire it really is a must to include in your trip. 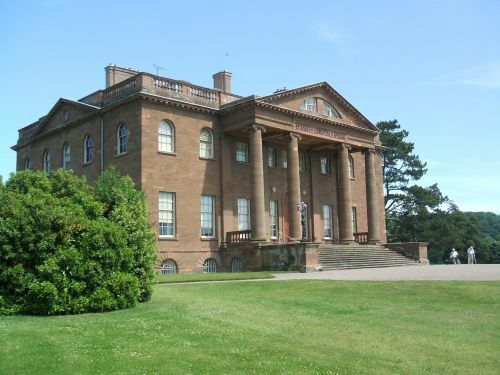 Created as the perfect house in the perfect setting Berrington has many secrets to uncover. In this, one of Henry Holland’s first houses, you can explore the family rooms and see how the servants moved around the house unseen by the family and guests. Find out what happened to William Kemp, Lord Cawley’s butler, discover the anguish of a grieving mother during the First World War or join a below stairs tour to see if you would have liked to have been a servant at Berrington. Berrington welcome dogs on leads in the grounds and parkland except the walled garden, shop ,tea room and mansion. For opening hours and further details please visit www.nationaltrust.org.uk/berringtonhall Also close by you may like to visit Croft Castle. Herefordshire sculptor Ed Elloitt, who specialises in life-size mystical figures, is holding a solo exhibition of his work from January 14 to 31 at Trumpet Corner Art Studios just outside Ledbury. The exhibition, Pieces of an Angel, includes his most recent sculpture commission, a wooden angel, which the National Trust has had on display at the Mottisfont estate in Hampshire. Ed was one of eight successful artists who won £250 and had materials supplied to create a figure for the winter Angels exhibition. Ed, from Tarrington, has had a fascination with art since a young boy, when drawing was a favourite pastime. After completing a foundation course at the university of Gloucestershire, he achieved an honours degree in Fine Art, specialising in Sculpture at Cardiff School of Art and Design. Marches Tours & Talks – our tour guide association – takes its name from this area of western England, which is called ‘The Marches’ meaning a ‘boundary’ – the boundary between England and Wales. One of the counties in these Marcher lands is Herefordshire – still a secret place known only to those who really seek it out. Here you will see an unspoilt rural landscape at its most beautiful, where you can wander and walk. We have no motorways and no theme parks – just a slower pace of life which gives you time to think and relax.